There has been a great deal of radio silence from SuperPhillip Central this past month. No longer, however, as we're ending the month with a plethora of reviews! The first is The Crew 2, released this past June on the PlayStation 4, Xbox One, and PC. The PS4 version is the game this review is based off of. Imagine, if you will, a racing game that takes you across the glorious continental United States, allowing you the freedom to roam its incredibly varied geography at your leisure. 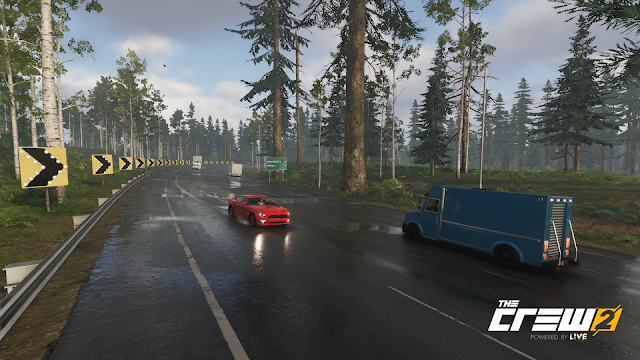 That's what you get with Ubisoft's The Crew 2, and not only are you able to speed through the lower 48 states in a car, but you can also do so by air and sea--something new to this sequel. 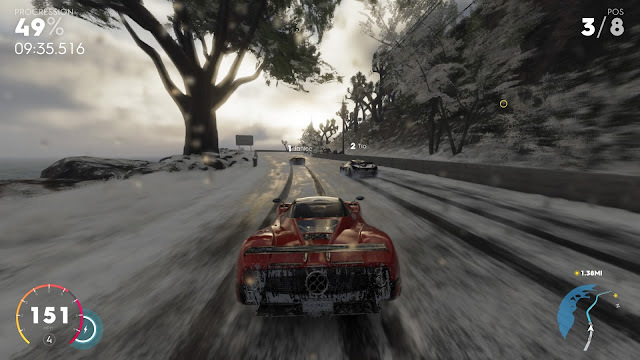 It's all part of The Crew 2's focus on getting followers from pulling off insane stunts as well as winning the various races and events spread across the country. Of course, you need not simply drive from coast to another, taking about an hour in real time to do so. Instead, you can select from a list of events from the in-game menu, or opt to zoom out of the map that displays everything in real time. You'll start zoomed in on your current location, zoom out to the block, the city, the region, and then the entire country to select one of the many event icons on the map. 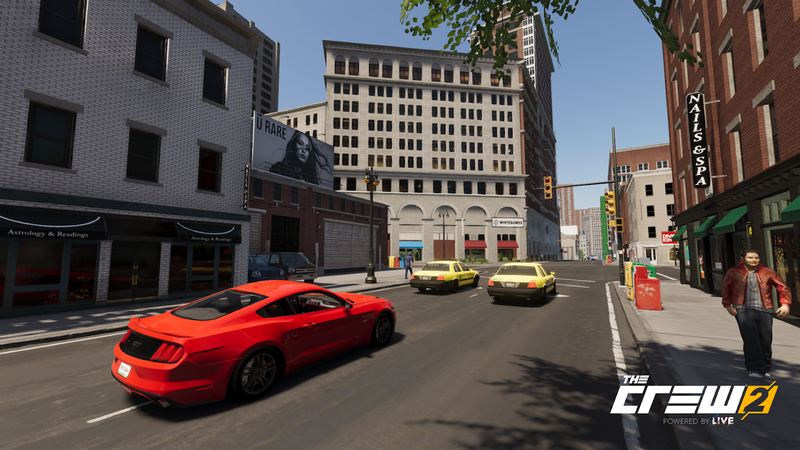 Exploring the Harlem neighborhood in The Crew 2's version of New York. Events come in numerous types across several different disciplines, each under the watch of one of four HQs spread across the country. 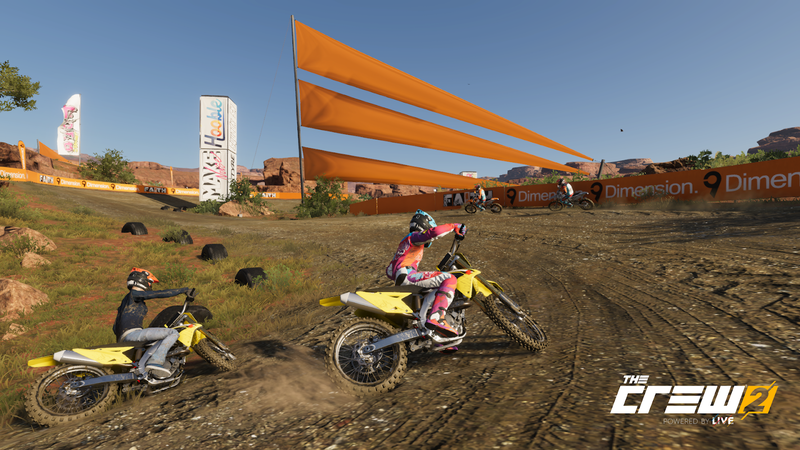 Whether it's street racing, pro racing, freestyle, or off-road, each HQ has a wide selection of events ready for you to take on. The street racing discipline has events where you speed through city streets, alleys, and even rooftops; events where you drift your car as long as possible to maximize your combo and score as many points as you can; drag races and long-distance hypercar races. Meanwhile, pro racing has power boat, plane, and touring car races to take on. The list of events is very much varied, which is great to see. If I found myself struggling with one type of event, I'd select the others within the same discipline to make progress within the story. Ruben?! That's not the name of someone who deserves to be in first--that's the name of a sandwich! The more followers you gain, which essentially serve as experience points, the more your icon gauge levels up, allowing you to participate in even more events. Winning events not only provides you with more followers, but it also provides you with new loot in the form of randomly assigned performance parts. The performance parts unlocked by clearing events and finding Live boxes sprinkled around the game world are used to upgrade each of your vehicles, which you can eventually own all 200+ of them, if you get that addicted to the game. There are about six different categories to boost the performance of your vehicle, but it's really not that involved. Basically, all you have to do is equip the highest numbered part in each of the six part categories, and you're golden. This can be extremely tedious, as you might have guessed, as you're always getting new parts and just constantly entering and exiting the menu is just repetitive as driving through the state of Kansas length-wise. Part of the Freestyle discipline, get down and dirty with Motocross. 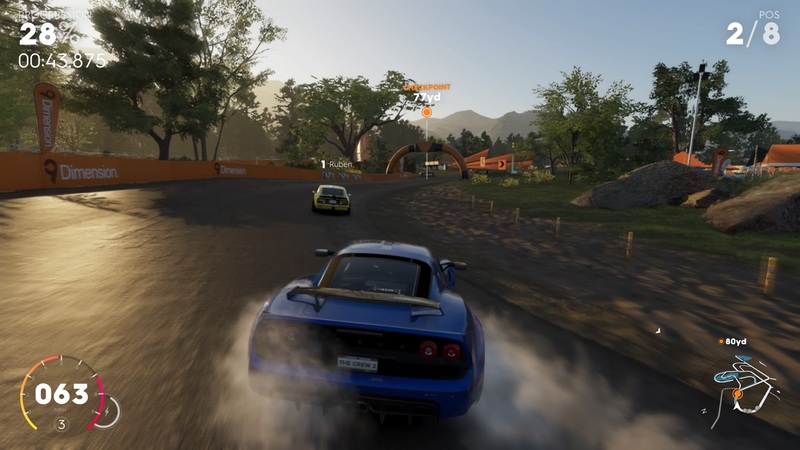 Also as you make your way through the ranks and gaining more followers, you get to participate in Live Xtrem races, which are the most enjoyable events that The Crew 2 has to offer. You start the game immediately within the first race of the Live Xtrem season, and these races in general have you transforming between vehicles on the fly at specific points within the races. You can go from a hypercar, jump off a ramp, and transform into a speedboat as you splash onto a river, continuing the race in one seamless maneuver. "Snow" time like the present to make the push to first place! ...I'll see myself out. These transformations aren't just limited to races, either. You can additionally seamlessly transform between your favorite vehicles while engaging in free roam. It's a rather awesome sight to fly a plane over my hometown of St. Louis, soar under the Gateway Arch, and then transform into a high-speeding car, perfectly touching down with the pavement below all in a single picture-perfect, skillful movement. If you haven't guessed already, there's a lot of smoothness to The Crew 2's transformations. Take to the skies and view Los Angeles in a brand-new way. What isn't always so smooth (nice segue, Phil) is trying to race at high speeds in events while trying to keep an eye on the in-game map in order to know where upcoming turns are. It is endlessly frustrating to lose a race at the last turn because you ended up missing it and careening past it because you couldn't focus on the map and race at the same time. Yes, you can hold the shoulder buttons to be placed back on the intended racing path, but when it's the final stretch of the race where you're now fifth place, it's sort of aggravating to have to redo a 10+ minute race when you made a last minute navigational error. 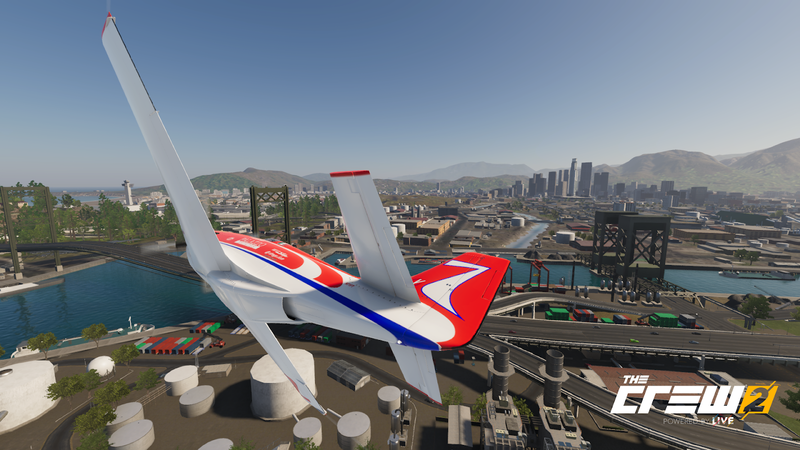 Another problem with The Crew 2 comes from its requirement to always have an online connection. You must play The Crew 2 online at all times, which is odd considering most of what I did within the game wouldn't even need such functionality, as I always competed against the AI. There are other players that inhabit the world, and you can join eponymous crews, race together in events, and the like, but overall, the interaction and options between crews and players in general is a bit lacking. 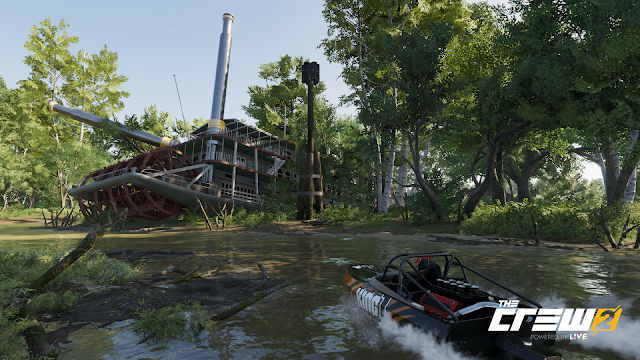 Now that you can explore the waters of the States in The Crew 2, who knows what you will discover? 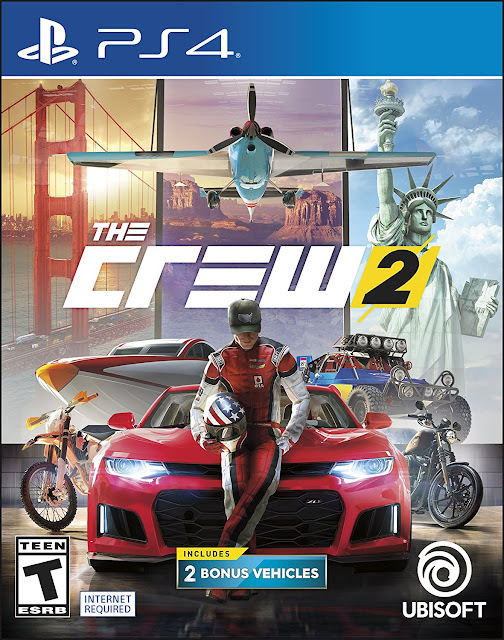 Without its online requirement The Crew 2 would be one of my favorite arcade racers of all time. It's pure joy and bliss to drive, splash, and soar through the continental United States. My personal favorite thing to do in the game is take long road trips and explore the world freely. However, when the servers for the game eventually expire, what you're going to be left with in The Crew 2 is a game that is no longer available to be played. You're also left with a game currently that requires an online subscription to Xbox Live or PlayStation Plus on top of purchasing The Crew 2 just to play the darn game. The reflections on these rainy roads make for a remarkable sight. For the most part, The Crew 2 does not disappoint when it concerns visuals. It says something, though, that despite this ridiculous online requirement, I did find myself lost within the game world of The Crew 2, eventually earning the Platinum with my PS4 copy. The amount of events in the game is amazing, though I wish there were more long distance and Live Extrem-like events where you switched between vehicle types mid-race, as those were my favorites in the game. Additionally, those were the most innovative and exciting. What's here in The Crew 2 is still a thrill of a ride, but it's not without its speed bumps--its many, many speed bumps.